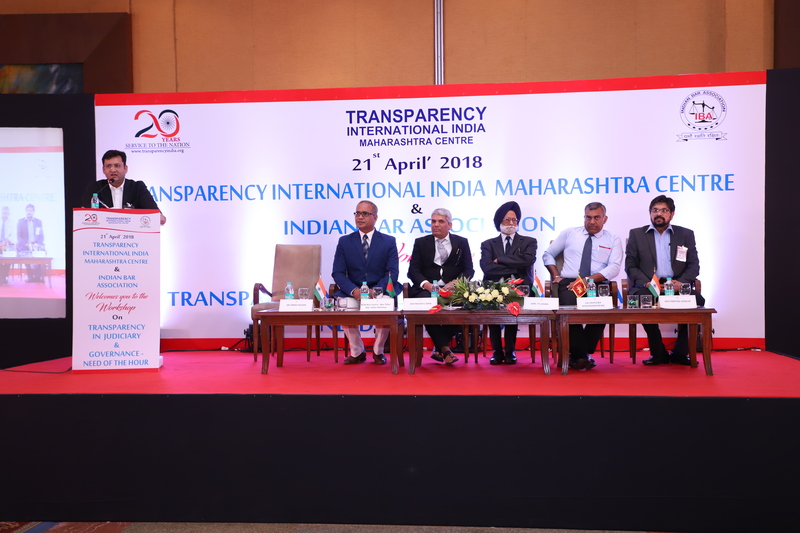 Transparency International India (TII), in association with The Indian Bar Association (IBA) had organized a workshop titled “TRANSPARENCY IN JUDICIARY & GOVERNANCE – NEED OF THE HOUR”. The Participants for this workshop were mainly crusaders from the legal fraternity and social activists fighting for the cause of ensuring transparency in Indian judiciary in order to protect and enhance the credibility of Justice delivering mechanism. The workshop focused on uniting the crusaders and activists to create corruptionfree India by raising awareness about corruption and other malpracticesin the Indian judiciary and discussing the possible ways/approaches to curb such malpractices. P.S Bawa, (Retd. IPS) former Chairman and Advisor Transparency International India. Dr. Anna Hazare was also one of the dignitaries invited for the workshop. However, Dr. Hazare was unable to attend the Workshop due to health reasons. The Welcome address was delivered by Advocate Nilesh Ojha, Chairman – Transparency International India, Maharashtra Centre, National President – Indian Bar Association, National President – Human Rights Security Council, where he invited everyone with open arms to join the mission to bring in transparency in the administration ofJustice. According to Adv. Nilesh Ojha “People’s Power is like Sunlight which, when focused can Ignite fire”. Adv. Nilesh C. Ojha further called upon the people from legal fraternity and social activist to join in for the mission for bringing in transparency in Judiciary.While explaining the significant take away for the participants of this workshop, he said that the workshop was a platform that brought together two powerful organizations – one being Transparency International India which is dedicated to the cause of eradicating corruption in our country and other being the Indian Bar Association comprising of fearless lawyers united in their fight against malpractices in the judiciary. Adv. Nilesh Ojha, further said that the clarion call given during the workshop for everyone to unite in their fight against corruption, was just the beginning. Adv. Nilesh Ojha emphasizing on the importance of staying united in fight against corruption, He further highlighted the recent milestone achieved under the guidance of and support from Dr. Anna Hazare who had given a nationwide call for ‘Jail Bharo Andolan’ in a movement initiated for installation of CCTVs i.e. audio and video recordings of court proceedings. The said movement was an initiative by IBA which Dr. Anna Hazare had agreed to lead. The order passed by Hon’ble Supreme Court regarding installation of CCTV cameras in courts came immediately after the ‘Jail Bharo Andolan’ call issued by Dr. Anna Hazare. Adv. Nilesh Ojha cited the Mantra of Dr. Babasaheb Ambedkar “Educate, Unite and Struggle” and explained that if one goes on alone in fighting against corruption, it is most likely thatthe person will face defeat, torture and harassment. It is the need of the time to unite and fight against corruption. However the ground situation remains that we all are scattered in our struggledue to which the corrupt people continue to enjoy. Hence there is strong need for people to unite and then fight, and he further added that Transparency International and TheIndian Bar Association have come together to provide active support to the victims of the corruption in judiciary. Justice Abu Taher Md. Saifur Rahman of the Supreme Court of Bangladesh acknowledged that the judiciaryis akinto CCTV tool which should possess clarity and transparency to ensure that common men/citizenscan attainjustice without hassles.He further acclaimed that judiciary of countries like Indonesia and Philippines are more transparent. Hon’ble Justice Rahman also endorsed for equal treatment of judges and advocates to have a transparent environment in the judicial system. Dr. Warna Parathiba Mahanamahewa, former Human Rights Commissioner Sri Lanka, enlightened the participants on adoption ofsuch practices/approaches by legal fraternity which shall ensure thatjustice prevails over everything else. Dr. Mahanamahewa also insisted that CCTVs must be installed in the chamber of the judges and that they should not shy away from the same in the name of privacy. He also spoke about the recent manipulations and politically motivated impeachment of Chief Justices in Sri Lanka. He emphasized the need for fair and impartial investigation in cases of deaths of judges to ensure fearless environment for the judiciary to perform its duties. Mr. P.S Bawa, (Retd. IPS) former Chairman and Advisor, Transparency International – India shared his experience while performing his dutiesand his association with Transparency International India. He also mentioned that the Government uses public moneyto fund its initiatives and welfare programs and as such has a solemn duty to ensure that public money is used fairly and transparently.He emphasized that “Judiciary is an important pillar in democracy” and further added that citizens should be made aware of their rights especially in the rural areas. Mr. P. S Bawa concluded by giving his support in order to accomplish the mission to Transparency International Chapter Maharashtra. Advocate Mathews Joseph Nedumpara – Chairman National Lawyers Campaign (NLC) and practising advocate in Bombay High Court and in Supreme Court. Advocate Ahmad M. Abdi – Chairman, Bombay Lawyers Association and practising advocate in Bombay High Court and in Supreme Court. Advocate Satish Talekar – Senior Counsel and practising advocate in Bombay High Court and in Supreme Court. Shri Udit Raj – Member of Parliament, National Chairman of the All India Confederation of SC/ST Organizations. Advocate Ghanshyam Upadhyay –Vice President, Indian Bar Association, practising advocate in Bombay High Court and in Supreme Court and a reformist. Advocate Ishwarlal S. Agarwal – Secretary, Indian Bar Association and practising advocate in Bombay High Court and in Supreme Court. Shri Ravindra Kotambkar – Editor-in-chief Dainik Sahasik. Advocate Vivek Ramteke – Human Rights Activist and practising advocate Bombay High Court. Advocate Vijay S. Kurle – Indian Bar Association, Maharashtra State President and practicing advocate in Bombay High Court. Advocate Partho Sarkar, Secretary Transparency International India Maharashtra and practising advocate in Bombay High Court. Advocate Onkar D. Kakade – Former Judgeand practising advocate in Bombay High Court and in Supreme Court. Advocate Subhash Jha – Legal Advisor, Indian Bar Association, Maharashtra and practising advocate in Bombay High Court and in Supreme Court. Advocate Mahesh Vasvani – Social Activist and and practising advocate in Bombay High Court. Dipali N. Ojha – Program Coordinator for the Workshop. The program was compered by Advocate. Tanveer Nizam and Advocate. Kanishk Gaikwad and the workshop was concluded with a Pledge taken by all the dignitaries and participants. “I pledge to fight corruption to create a more secure, democratic and prosperous world of liberty and justice for all”.